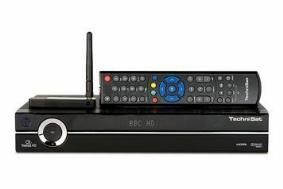 Technisat's HDFS Freesat set-top box now supports BBC iPlayer | What Hi-Fi? It seems every other news story at the moment refers to a new digital TV box or on online catch-up service, so here's one that aptly combines the two. And as an added bonus, you can also connect to the iPlayer wirelessly via the HDFS box. Using Technisat's own USB WLAN adaptor the iPlayer service can be accessed via the red button. What's more, multimedia files stored in shared folders on a PC can be streamed wirelessly to the Technisat HDFS and played on your TV. If you don't fancy getting yourself a wireless adaptor, then you can also connect using a wired connection via ethernet. The software update is live now so your box should update automatically or you can 'force' the update within your settings menu.